While working as an intern for the Smithsonian Cultural Rescue Initiative, my task this semester has been to compile a complete list of museums and cultural sites for the country of Norway. Roughly the size of Montana, Norway has over 900 recognized museums, galleries, heritage sites, and historical villages. A large majority of these sites are open-air museums that have hiking trails incorporated into them and are free to the public thanks to the Norwegian philosophy of allemannsrett, or “every man’s right” to explore public land. Oscarsborg Fortress is no exception and is free to public visitors year round. since the 1600s. Photo courtesy of Wikimedia Commons. 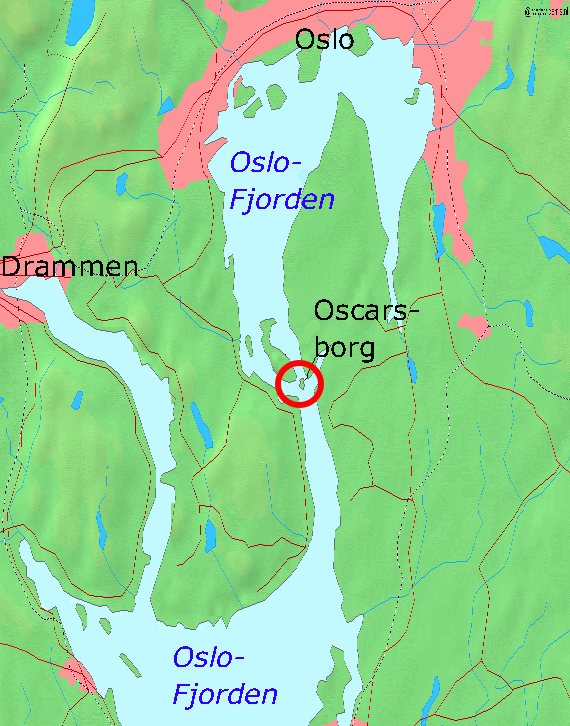 Located strategically in the narrows at Drøbak Sound, Oscarsborg is down river from Oslo and serves as the main line of defense for the Norwegian capital. Fortifications at Oscarsborg began in the 1600s, although the Fortress itself was not completed until 1855 under King Oscar I. Soon after its completion, Norway realized that the fortress was already outdated due to improvements in artillery and military technology, so they implemented a complete overhaul on the fortress in 1890. Defenses such as an underwater stone wall, a minefield, and state-of-the-art underwater torpedo tubes were implemented as well as large 28cm calibre gun. 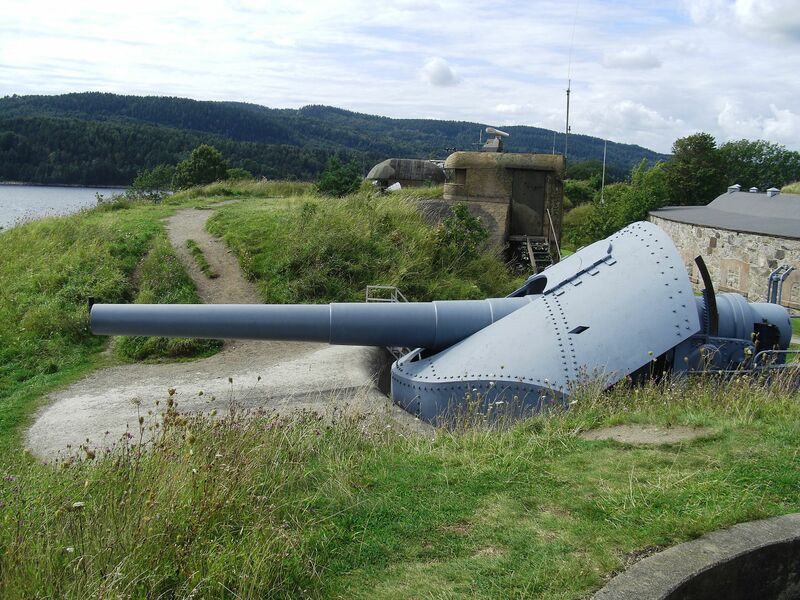 28cm calibre gun at Oscarsborg Fortress, Photo courtesy of Wikimedia. In an ironic twist in history, most of the upgrades at Oscarsborg Fortress were purchased encouraged by Germany, including the 28cm guns. However, the underwater torpedo tubes were the only improvement not bought from Germany (instead from Austria-Hungary) and kept secret from Germany. This development would be crucial in the events to come. On April 9, 1940 the true test of Oscarsborg Fortress’ strength was tested. During the beginning stages of the invasion of Norway by Germany in World War II, the state-of-the-art German cruiser Blücher navigated the waters en route to Oslo. Oscarsborg combination of their secret underwater torpedo launchers and 28cm guns was enough to quickly sink the cruiser, buying time for the Norwegian King, Government, and Parliament to flee from Oslo. 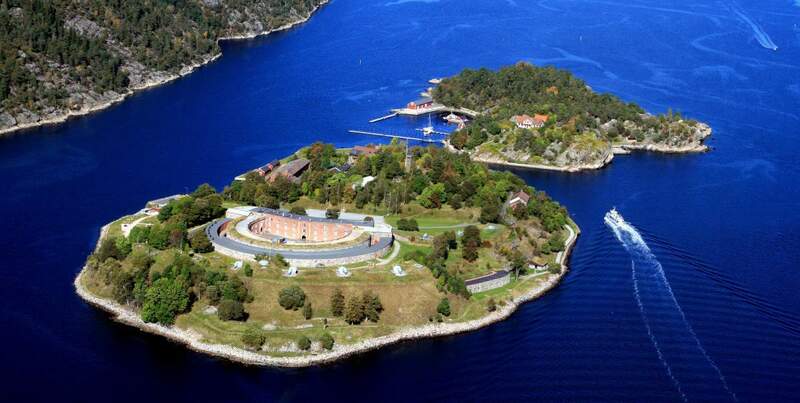 During World War II, Oscarsborg Fortress was occupied by German forces that used it as a strategic military base. This fact is especially important to our work here at the SCRI, as we are also documenting important military cultural sites that could potentially be utilized by invading forces in the case of war. The Fortress remained occupied by German forces until 1945, after which Norwegian forces were able to expel the occupying Germans. After World War II, The Oscarsborg Fortress remained largely unused until it was finally ‘abolished’ in 2002. The Oscarsborg island is now a large tourist destination for people visiting Oslo. The island around the fortress hosts dozens of hiking trails, venues for concerts and operas, and an annual rock music festival. The Oscarsborg Fortress Museum is also a major tourist destination and is free to visitors. The museum contains a large collection of naval artifacts and is mostly focused on the events surrounding the sinking of Blücher. It also tells the history of the island, provides guided tours of the artillery stationed on the island, and even offers tours of the underwater torpedo tubes. 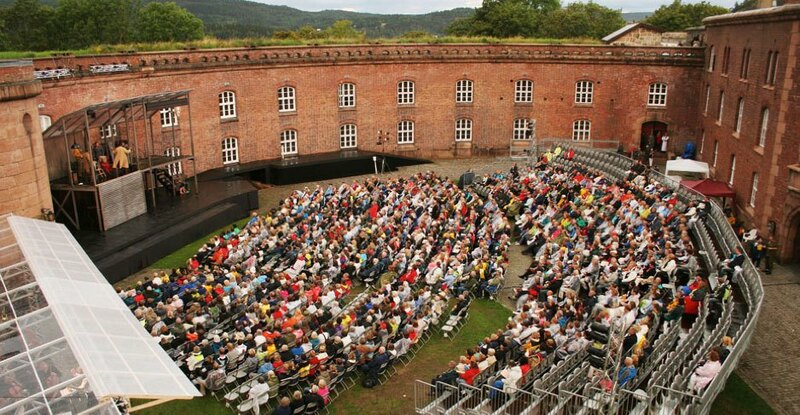 Oscarsborg Fortress and Museum is just a ferry ride away from Drøbak, free, and offers great historical information for all audiences.